The first meetings with the SJC official representatives and later also "indpendent" commanders which were supporting that faction were a real suprise for Karina. She had only once used a phrase which she had from her father: "Ex U****a", and the amount of support that she received was unbeliavable. Income made in this single day was few times more as she had in her assets one day before! 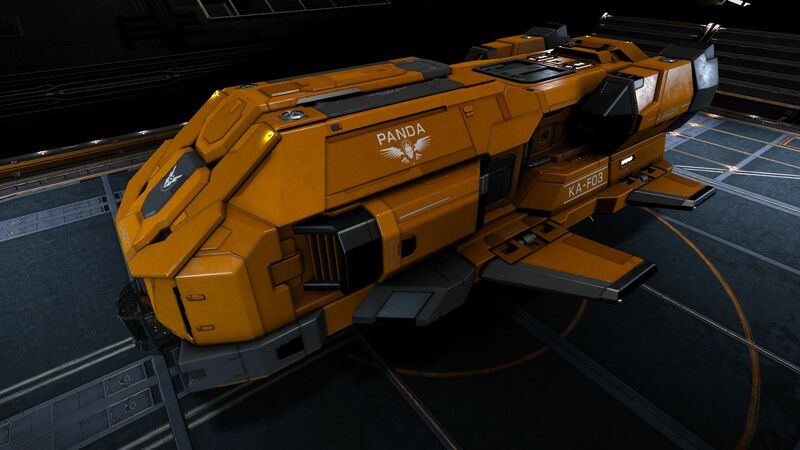 She was able not only purchase bigger trading ship - Type-7 Transporter which she named the "Panda", but also earned enough cash for thinking about even bigger and better ships. And of course there still was invitation to visit Felicity and the McQuinn, which was another mysterious person. Suddenly she had available so much new activities and was needed to decide which will be first and which will be the last. The commanders, which were selflessly helping her, also gave her few further useful advices and also suggested to visit certain offices on the Greeboski station in Phiagree, if she would like know more about their "independent" organisation. "I can do that", she thought, "but for now I need to go my own way alone ... but if these nice commanders will need help again, then I will come." Karinda made a decision to visit as first Ms Felicity Farseer. But her homestead was far away and there was also a note about the need to bring one unit of Meta-Alloys (MA). She started study data sources which she received during her work for SJC, and it revealed more different sources of MA, but all these were in Pleiades region which was more as 400 ly far away. "I need specialised exploration vessel" thought Karina and that was the moment when was started preparations of the "Bubo" ship. As first she moved into Li Young-Rui (shortuct Lyr, Lyr is one from minor Powers in ED) exploited space where all ships and equipment have 15% discount and purchased there small Diamondback Explorer (DBX). Jump-range of the DBX was, with light equipment and with the best A grade frameshift drive (FSD), better as 30 ly and the travel to the Pleiades region was suddenly only a longer walk in the park. The Barnacle locations were all on given coordinates and everything looked so easy, until a moment when she were approaching one from Barnacle sites marked as "Ripe". Ships scaners were not showing any signs of possible danger, when suddenly sounded an missiles attack warning. Karina was able in such short time only switch ship's power into shields, which were in next moment struck with salvo of missiles. On radar for a moment appeared hostile target, but that one have in next moment vanished and this only rised up confusion of Karina. She used boost of engines to quickly move her Bubo behind nearby hill. She carefully landed, deployed the SRV and have very slowly approaching to the site where she got so warm welcome. The specialised radar mounted on the SRV finally revealed what is going on ... the site was guarded with group of small drones. She returned to the ship, which was luckily armed with two medium pulse lasers and gimballed large multicanon. Now was she able with manual aiming, while she was constantly switching ship's power priorities between the shields (when were missiles inbound) and weapons (when target appeared for short time on radar), to use ship weapons and slowly one by one destroy all these dangerous drones. Harvesting the MA and also other micromaterials (raw) appearing on the site was then with SRV an easy task. 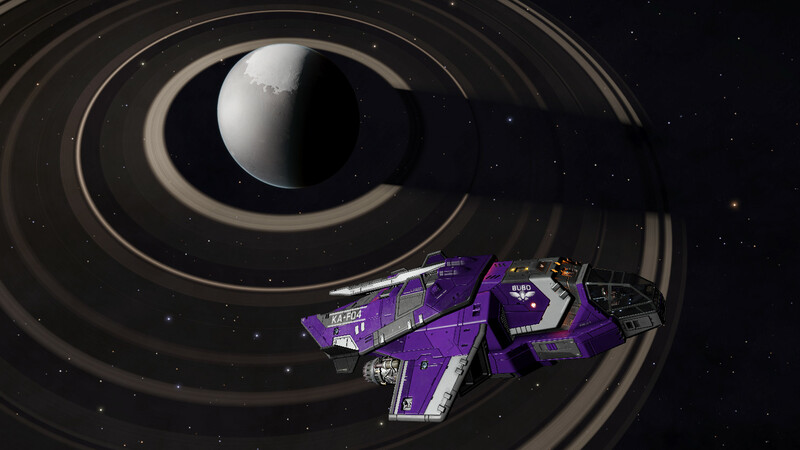 Later visit on Farseer residence was going well and "Bubo" got upgrades to few systems; the most noticable was upgrade to the FSD jump range (increasing single jump to almost 50 ly) and upgrade to ship thrusters (clean thrusters) which now worked much more efficiently while producing less heat. Bubo had now much better jump range, slightly better power output from powerplant, better radar detection and improved engines. All this needed bigger part of already accumulated micromaterials, but this effort had clearly visible results and Karina decided learn more about "Engineers" ... "My ships may be smaller and less strong", she thought, "but if they will be more difficult to detect, then I can be much more in safe. Heat produced by ship parts is the key to this and therefore I need to learn more how it works!" The surrounding space around her ship was still dangerous, but Karina now had feel much more confident.